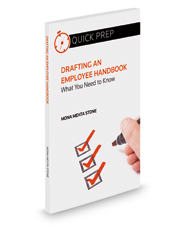 This Aspatore legal title is a user-friendly and practical guide to creating an employee handbook that will help prevent and defend against workplace disputes. Most businesses adopt a reactive approach to addressing employment policies, only worrying about them after an issue arises or someone complains. However, a well-written handbook can be a forceful shield against potential grievances and costly litigation. Moreover, it can improve employee morale, increase productivity, and forestall complaints.